Dear Suomi-saundi and freeform psytrance sounds lovers! 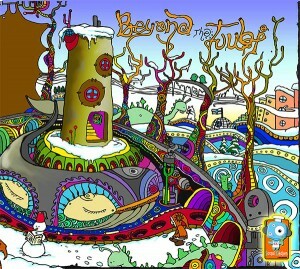 Sound Kitchen Records proudly present their first compilation, Beyond The Tuubi. Let the cold winter days fade as our debut release will warm you with funky grooves, pumping beats, blasting sounds, and strange, colourful melodies by the Finnish masters of rocking dance floors. Immerse yourself into Suomi-saundi journey in all its glory! Mastered by Snyper, artwork by Ant-Ti, and compiled by Spuge User and Pecheneg. MP3 Download | FLAC Download | WAV Download · Download count: 6,975. People who think it aint psychedelic, obviously haven’t experienced it in nature with real suomi freaks! This music is uniquely great. Finally got around to listening to this one properly. At the moment I’d say it’s my favorite compilation from 2014, don’t find a lot of music these days that I can just leave on repeat. Superb work indeed. The cover is equally adorable. P.S. If it makes any difference, I’m not a die-hard suomi fan. some of my fave suomi guys on here thanks!